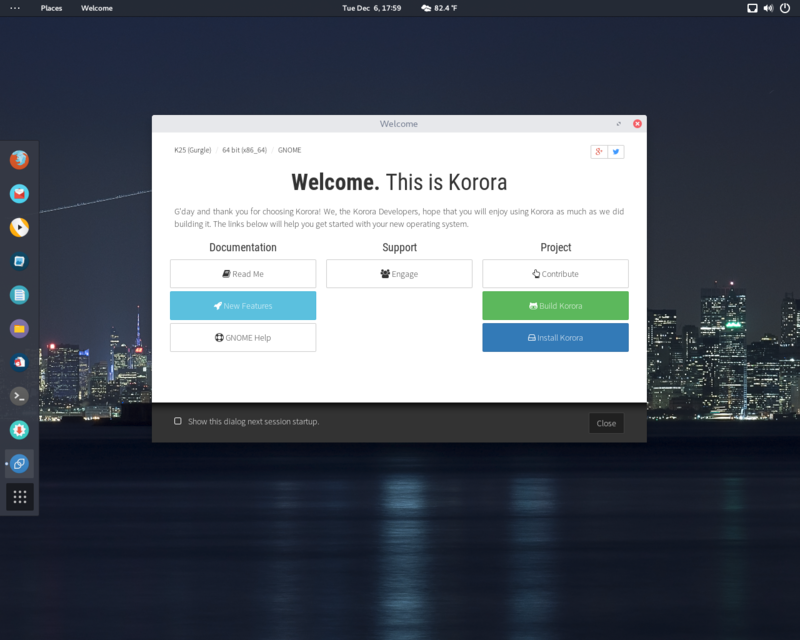 Rate this project Chris Smart has announced the availability of the beta release of Korora 18, a Fedora-based distribution with GNOME or KDE desktops and featuring many user-friendly enhancements. This is the project's first release under the new name (previously the distribution was called "Kororaa Linux"). From the release announcement: "The Korora Project is pleased to announce the first beta release of version 18 (code name 'Flo') which is now available for download. Derived from Fedora 18 stable, this release comes with the usual Korora extras out of the box, but now also includes: Adobe Flash plugin; experimental support for Valve's Steam client; unburden-home-dir, which moves cache files (like in Firefox profiles) onto RAMFS at login; undistract-me, which pops up a GUI notification when a terminal command has completed. It is now possible to upgrade from Kororaa 17 to Korora 18, thanks to Fedora’s FedUp tool." Download links: korora-18-beta-x86_64-kde-live.iso (2,227MB), korora-18-beta-x86_64-gnome-live.iso (1,681MB). Korora was born out of a desire to make Linux easier for new users, while still being useful for experts. The main goal of Korora is to provide a complete, easy-to-use system for general computing. Originally based on Gentoo Linux in 2005, Korora was re-born in 2010 as a Fedora Remix with tweaks and extras to make the system "just work" out of the box. Jim Dean has announced the release of Korora 26, a brand-new version of the project's desktop-oriented Linux distribution based on Fedora, but with many user-friendly enhancements: "The Korora project is pleased to announce the release of version 26 (code name 'Bloat') which is now available for download. Korora 26 continues the tradition of having code names based on characters from 'Finding Nemo'. Existing Korora users can upgrade to 26 'Bloat', see our upgrade guide. Features: Cinnamon 3.4 - this new release of Cinnamon includes lots of refinements to the popular desktop environment; GNOME 3.24 brings a number of new features to the GNOME desktop including the new Night Light setting which reduces eye strain; KDE Plasma 5.10 gains a new default desktop view and improvements to the Task Manager among a long list of improvements; MATE 1.18 - this release completes the migration to GTK+ 3 but also includes many new features; Xfce 4.12 - this release mainly focused on polishing the desktop and improving the user experience in various ways." Read the full release announcement for more details. Download (SHA256, signature, pkglist): korora-live-cinnamon-26-x86_64.iso (2,474MB), korora-live-gnome-26-x86_64.iso (2,402MB), korora-live-kde-26-x86_64.iso (2,710MB), korora-live-mate-26-x86_64.iso (2,653MB), korora-live-xfce-26-x86_64.iso (2,332MB). Jim Dean has announced the release of Korora 25, a new version of the Fedora-based distribution with various user-friendly enhancements and a choice of five desktop environments - Cinnamon, GNOME, KDE Plasma, MATE and Xfce: "The Korora project has released version 25 (code name 'Gurgle') which is now available for download. Due to popular demand there is a KDE Plasma release. While it has the usual Korora extras, in order to reduce the workload in bringing this back we have made the look more vanilla. Features: Cinnamon 3.2 includes lots of refinements; GNOME 3.22 has improved support for the Wayland compositor, Wayland is now the default for the GNOME edition; Mate 1.16 focused on bug fixes; Xfce 4.12 focused on polishing the desktop and improving the user experience; derived from Fedora 25, Korora benefits from Fedora's long tradition of bringing the latest technologies to open-source software users; 64-bit only." Here is the complete release announcement. Download (SHA256, signature, pkglist): korora-live-cinnamon-25-x86_64.iso (2,092MB), korora-live-gnome-25-x86_64.iso (2,188MB), korora-live-kde-25-x86_64.iso (2,442MB), korora-live-mate-25-x86_64.iso (2,201MB), korora-live-xfce-25-x86_64.iso (2,124MB). After three months of beta testing, Korora 23 final is out. Korora is a Fedora-based distribution featuring many user-friendly enhancements as well as a choice of five desktop environments - Cinnamon, GNOME, KDE, MATE and Xfce. From the release announcement: "The Korora project has released version 23 (code name "Coral") which is now available for download. Existing 23 beta users do not need to re-install, just keep installing regular updates. For the last three months we have been waiting for the RPMFusion repositories to be declared stable before releasing Korora 23. These community packages provide support for things that Fedora doesn't normally ship, like multi-media codecs and proprietary kernel drivers. Normally, the stable RPMFusion repositories are available a few weeks after a Fedora release, however the community has moved to new infrastructure and this has caused some delays. Features: Cinnamon 2.8, GNOME 3.18, KDE Plasma 5.5.4, MATE 1.12, Xfce 4.12...." Download (MD5, pkglist): korora-23-x86_64-cinnamon.iso (1,990MB), korora-23-x86_64-gnome.iso (2,106MB), korora-23-x86_64-kde.iso (2,157MB), korora-23-x86_64-mate.iso (1,988MB), korora-23-x86_64-xfce.iso (1,842MB). The Korora development team has announced the availability of the beta release of Korora 23, a set of user-friendly, Fedora-based distributions available in Cinnamon, GNOME, KDE, MATE and Xfce flavours: "The Korora project is very pleased to announce that the beta release of version 23 (code name 'Coral') is now available for download. Although this is a beta release of Korora, it is derived from Fedora 23 stable and should be ready for every day use. Features: Cinnamon 2.6 - this new release of Cinnamon targets a smoother experience, improved settings and updates to the file manager, Nemo; GNOME 3.18 brings Google Drive integration in Files, automatic screen brightness and Touchpad gestures; KDE Plasma 5.4.2 - a modern, stable desktop environment, KDE Plasma 5.4.2 sees a large number of improvements including better dpi support and improved memory use plus many bug fixes; MATE 1.10...." Continue to the release announcement for more details. Download (MD5) (pkglist): korora-23-beta-x86_64-cinnamon-live.iso (1,936MB), korora-23-beta-x86_64-gnome-live.iso (2,059MB), korora-23-beta-x86_64-kde-live.iso (2,132MB), korora-23-beta-x86_64-mate-live.iso (1,928MB), korora-23-beta-x86_64-xfce-live.iso (1,957MB). Chris Smart has announced the release of Korora 22, a set of user-friendly, Fedora-based desktop Linux distributions with a choice of Cinnamon, GNOME, KDE 5, MATE and Xfce desktops: "It has been a long road to the Korora 22 (code name 'Selina') release and we're sorry that it has taken so long. However, it is now finally available for download. KDE 4 is no longer supported in Korora 22. If you do not wish to upgrade to KDE 5 then please stick with Korora 21. With this release we've decided to no-longer include Adobe Flash out of the box, due to the continued high number of security flaws. The repository is still enabled, however, and if you wish to use Flash you can install it using the package manager, or command line 'sudo dnf install flash-plugin' - or install and use Google Chrome which has the current up-to-date version of Flash." Continue to the release announcement for a full list of new features. Download (MD5, pkglist): korora-22-x86_64-cinnamon-live.iso (1,865MB, torrent), korora-22-x86_64-gnome-live.iso (2,027MB, torrent), korora-22-x86_64-kde-live.iso (2,589MB, torrent), korora-22-x86_64-mate-live.iso (1,948MB, torrent), korora-22-x86_64-xfce-live.iso (1,842MB, torrent). Chris Smart has announced the release of Korora 21, a set of user-friendly desktop Linux distributions, based on Fedora 21, with a choice of Cinnamon, GNOME, KDE and Xfce desktops: "It has taken a few weeks longer than we had hoped, but we're finally happy to announce that the final release of version 21 (code name 'Darla') is now available for download (we strongly recommend using BitTorrent). The 21 beta was quite successful and we were able to make some minor changes to help improve the overall experience. Users who are currently on the beta need not re-install, updates are provided via the package manager. Users who are on 20 may consider upgrading, however this is not necessary as version 20 is supported for another 6 months or so." Read the rest of the release announcement for a detailed introduction to the new release. Download (SHA256, pkglist): korora-21-x86_64-cinnamon-live.iso (1,753MB, torrent), korora-21-x86_64-gnome-live.iso (1,859MB, torrent), korora-21-x86_64-kde-live.iso (2,547MB, torrent), korora-21-x86_64-xfce-live.iso (1,716MB, torrent). Ian Firns has announced the availability of the beta release of Korora 21, a set of Fedora-based distributions in Cinnamon, GNOME, KDE and Xfce editions: "The Korora project is very pleased to announce that the first beta release of version 21 (code name 'Darla') is now available for download. 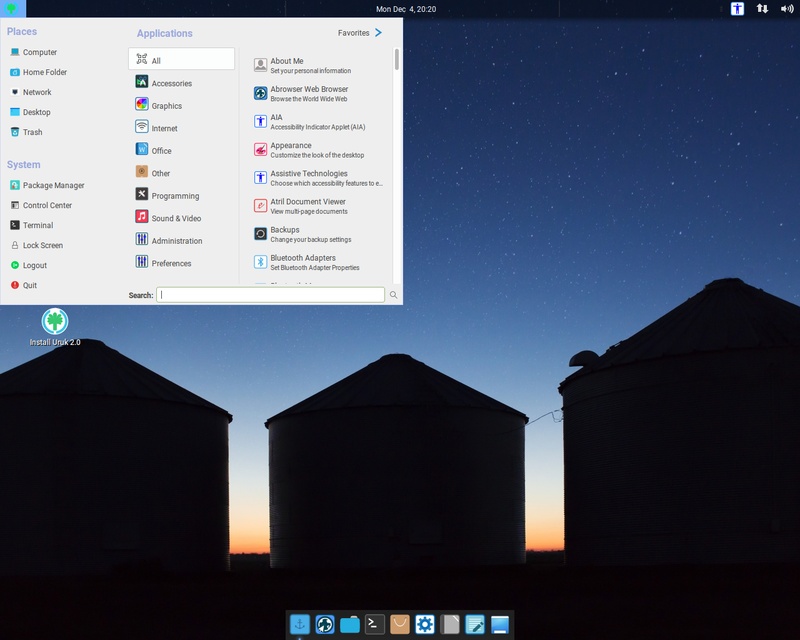 Although this is a beta release of Korora, it is derived from Fedora 21 stable and should be ready for everyday use. It has been almost a year since our last release and we have spent a lot of time developing some new core technologies which lay the groundwork for some exciting features in the future. Korora 21 sees the debut of 'Lens' which we'll explain in detail over the coming weeks. Features: Cinnamon 2.4, GNOME 3.14, KDE Software Compilation 4.14.3, Xfce 4.10.1...." Read the release announcement for further information. Download (MD5) (pkglist): korora-21-beta-x86_64-cinnamon-live.iso (1,787MB), korora-21-beta-x86_64-gnome-live.iso (1,845MB), korora-21-beta-x86_64-kde-live.iso (2,698MB), korora-21-beta-x86_64-xfce-live.iso (1,703MB). Ian Firns has announced the release of Korora 20, a set of Fedora-based desktop Linux distributions with a choice of Cinnamon, GNOME, KDE, MATE and Xfce desktops: "The Korora project is pleased to announce the stable release of version 20 (code name 'Peach') which is now available for download. This release brings with it a significant amount of work by the team and community to bring not two but five desktops that have been shaped for a genuine Korora experience. The additions of Cinnamon, MATE and Xfce represent the growth of our community and their contributions. A quick summary of the features: GNOME 3.10 represents another iteration to the new desktop which is also targeting native Wayland support; KDE 4.11 brings a host of bug fixes...." Read the full release announcement for further information. Download (MD5): korora-20-x86_64-cinnamon-live.iso (1,671MB), korora-20-x86_64-gnome-live.iso (1,807MB), korora-20-x86_64-kde-live.iso (2,375MB), korora-20-x86_64-mate-live.iso (1,700MB), korora-20-x86_64-xfce-live.iso (1,612MB).